In addition to honey’s health benefits and amazing properties for treating colds, flus, coughs and sore throats, honey makes a wonderful first aid ointment as well as a beauty aid. Topically, it acts as a humectant. That means that it attracts and preserves water. It’s also an antibacterial and an antifungal. Keeping honey in your first aid kit or cabinet can be extremely useful. First, honey can be used to treat diarrhea, stomach upset, and even to help kill harmful bacteria in the gut which may cause food poisoning. Specifically, it is used to treat stomach ulcers caused by H. pylori bacteria. You can apply honey directly to a burn including a sunburn. It helps reduce pain and decrease the time it takes to heal. In fact, according to WebMD, honey was used by the ancient Greek physician Dioscorides in 50 A.D. for sunburn and infected wounds. 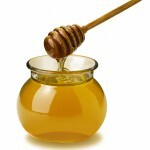 And the healing properties of honey are mentioned in many religious texts including the Bible, the Koran, and Torah. A study in India looked at the wound healing effects of honey compared to their conventional treatment using silver sulfadiazine. They tested the two on patients with first degree burns. After one week of treatment, 91% of honey treated burns were infection free compared with only 7% who received the conventional treatment. And the honey treated group’s burns healed more quickly. You can apply honey directly to a wound or to coat a dressing before wrapping a wound. Wounds include ulcers, cuts, abrasions, and even places where you’ve had an incision or skin was taken for grafting. Clinical trials have shown that the antiseptic properties of honey combined with the humectant properties provide an effective means to heal wounds of all types. The enzymes in honey are almost as powerful as hydrogen peroxide as an antiseptic. It helps clean the wound, reduce infection, reduce pain and decrease the amount of time it takes to heal. Honey also stops infection and provides a natural barrier that prevents any bacteria from entering. The humectant properties keep the wound moist which helps the healing process. In addition to providing a means of natural first aid, wound and burn care, and to solve digestive problems, honey is also a natural skin care ingredient. Remember that honey is a humectant? That means it attracts and preserves water. When placed on your skin it aids in hydration and helps keep your skin moist and fresh, great for dry winter skin, treatment of ezcema, and so many other things. It also has antibacterial properties which makes it an exceptionally useful product for acne prone skin.